We had learnt that woollen clothes are made from animal fibres. You also know that cotton clothes are made from plant fibres. We wear woollen clothes during winters when it is cold outside. Woollen clothes keep us warm. We prefer to wear light coloured cotton clothes when it is hot. These give us a feeling of coolness. You might have wondered why particular types of clothes are suitable for a particular season. In winter you feel cold inside the house. If you come out in the sun, you feel warm. In summer, you feel hot even inside the house. How do we know whether an object is hot or cold? How do we find out how hot or cold an object is? In this chapter we shall try to seek answers to some of these questions. In our day-to-day life, we come across a number of objects. Some of them are hot and some of them are cold. Tea is hot and ice is cold. List some objects you use commonly in Table-1. Mark these objects as hot or cold. We see that some objects are cold while some are hot. You also know that some objects are hotter than others while some are colder than others. How do we decide which object is hotter than the other? We often do it by touching the objects. But is our sense of touch reliable? Let us find out. Take three large mugs. Label them as A, B and C. Put cold water in mug A and hot water in mug B. Mix some cold and hot water in mug C. Now dip your left hand in mug A and the right hand in mug B. After keeping the hands in the two mugs for 2 minutes, dip the hands simultaneously in mug C . Do both the hands get the same feeling? Then, how do we find out how hot an object really is? A reliable measure of the hotness of an object is its temperature. Temperature is measured by a device called thermometer. Have you seen a thermometer? Recall that when you or someone else in your family had fever, the temperature was measured by a thermometer. The thermometer that measures our body temperature is called a clinical thermometer. Hold the thermometer in your hand and examine it carefully. If you do not have a thermometer, request a friend to share it with you. A clinical thermometer looks like the one shown in Fig-1. A clinical thermometer consists of a long, narrow, uniform glass tube. It has a bulb at one end. This bulb contains mercury. Outside the bulb, a small shining thread of mercury can be seen. If you do not see the mercury thread, rotate the thermometer a bit till you see it. You will also find a scale on the thermometer. The scale we use is the Celsius scale, indicated by oC. 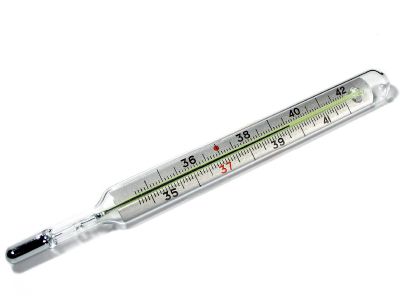 A clinical	thermometer reads temperature from 35 oC to 42 oC. Wash the thermometer, preferably with an antiseptic solution. Hold it firmly and give it a few jerks. The jerks will bring the level of mercury down. Ensure that it falls below 35 oC. Now place the bulb of the thermometer under your tongue. After one minute, take the thermometer out and note the reading. This is your body temperature. The temperature should always be stated with its unit, oC . What did you record as your body temperature? The normal temperature of human body is 37 oC. Note that the temperature is stated with its unit. The temperature of every person may not be 37 oC. It could be slightly higher or slightly lower. Actually, what we call normal temperature is the average body temperature of a large number of healthy persons. The clinical thermometer is designed to measure the temperature of human body only. The temperature of human body normally does not go below 35oC or above 42oC . That is the reason that this thermometer has the range 35oC to 42oC. How do we measure the temperature of other objects? For this purpose, there are other thermometers. One such thermometer is known as the laboratory thermometer. Your teacher will show you this thermometer. Look at it carefully and note the highest and the lowest temperature it can measure. 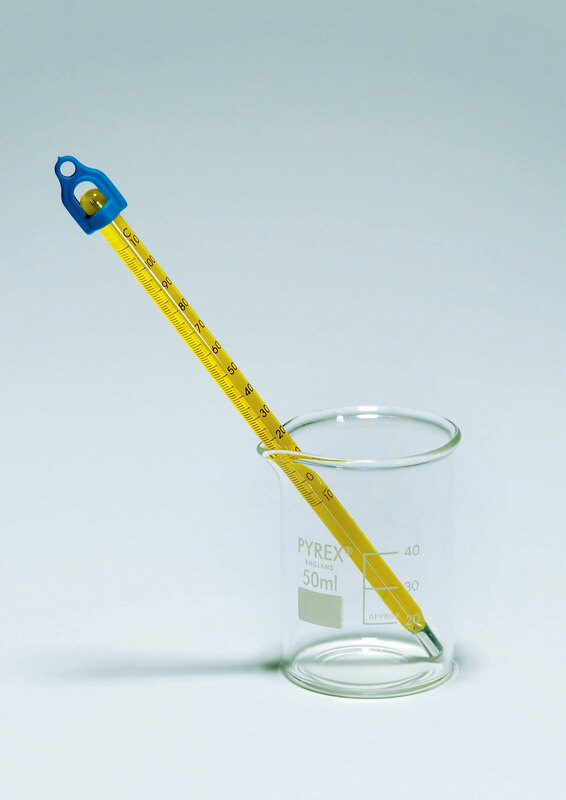 The range of a laboratory thermometer is generally from - 20oC (Fig-3). Also, as you did in the case of the clinical thermometer, find out how much a small division on this thermometer reads. You would need this information to read the thermometer correctly. Let us now learn how this thermometer is used. Take some tap water in a beaker or a mug. Dip the thermometer in water so that the bulb is immersed in water but does not touch the bottom or the sides of the container. Hold the thermometer vertically (Fig. 3). Observe the movement of mercury in the thermometer. Wait till the mercury thread becomes steady. Note the reading. This is the temperature of water at that time. You may recall that while taking your own temperature, you have to take the thermometer out of your mouth to note the reading. Can you then use the laboratory thermometer to measure your body temperature? Obviously, it is not convenient to use the laboratory thermometer for this purpose. Why does the mercury not fall or rise in a clinical thermometer when taken out of the mouth? Observe a clinical thermometer again. Do you see a kink near the bulb (Fig-4). What is the use of the kink? It prevents mercury level from falling on its own. Clinical thermometer is used to measure our body temperature. The range of this thermometer is from 35o C to 42o C. For other purposes, we use the laboratory thermometers. The range of these thermometers is usually from –10°C to 110°C. The normal temperature of the human body is 37o C.